Sofa SuppaStore Themeforest шаблон интернет магазина WordPress. Оригинальная и довольно красивая тема для создания современного интернет магазина на популярном движке WordPress. С помощью интернет магазина Вы сможете развить Вашу торговлю, практически любого направления. Чтобы Вам было легче разобраться в работе с этой темой, в архиве лежит файл с демо данными, устанавливайте этот файл на Ваш движок и Вы сможете на примере разобраться в работе шаблона. После установки демо данных у Вас будет сайт как на демо варианте шаблона. Посмотреть можете по ссылке выше. Также присутствуют файлы помощи, читайте их и Вам легче будет понять как работать с интернет магазином на WordPress. The Sofa SuppaStore theme is designed for ecommerce merchants. Provided with a host of powerful features, it allows an ecommerce site to get up and running in short order and to have access to several plug-ins right from the point of installation. This theme is a bit different than many of the other ecommerce themes from ThemeForest in that it has more functionality than many of them and is more than a visual framework for an ecommerce site. Sofa SuppaStore comes with the Stock Inventory Manager and Orders Tracking plug-ins, so you don’t have to install those features after you’ve gone through the trouble of installing the theme itself. It’s also provided with plenty of visual enhancements for the homepage, such as a choice of 2 different sliders and plenty of widgets that you can use to add functionality for the site. There are also plenty of shortcodes that you can use to easily add and remove content as needed. The theme comes with shipping price plug-ins that allow you to have the total cost calculated by country or by product, so some of the hassle of logistics is taken care of for you by the theme. The theme also comes with a newsletter plug-in that allows you to provide this feature for your visitors. If you have visitors from around the world, you can use the localization feature to make sure that the content is accessible to them. There is data included with the download, so it’s easy to swap it out and to replace it with your own so that you can get up and running in the shortest time possible. The theme is supported by included documentation, a how-to website and a FAQ that should take care of most user concerns. 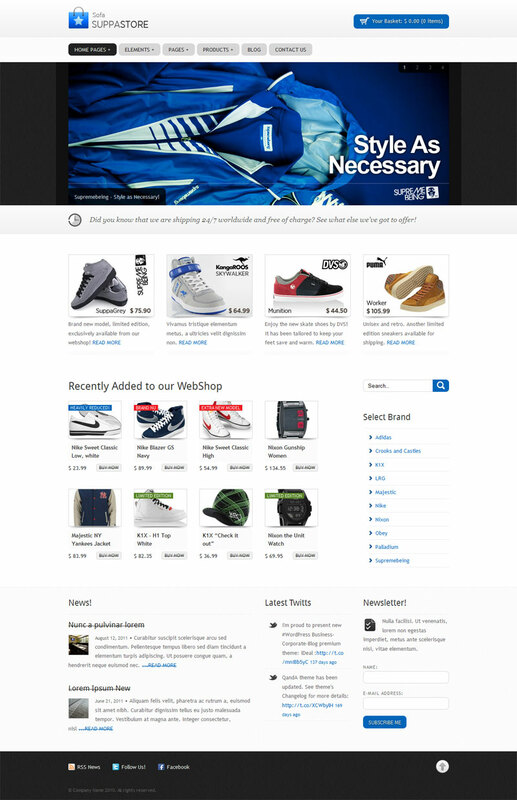 This theme comes with most of what a user will need to get up and running as an ecommerce site and allows the user to control the theme through a powerful backend interface. If you need an ecommerce site up and running fast, this is one of the better options out there. The inclusion of plug-ins that are necessary to the task makes it a sensible choice in that you won’t find yourself scrambling around to install them after the fact and that, of course, means that you can be up and running and taking orders that much faster. PayPal and mail order payments are supported upon installation.